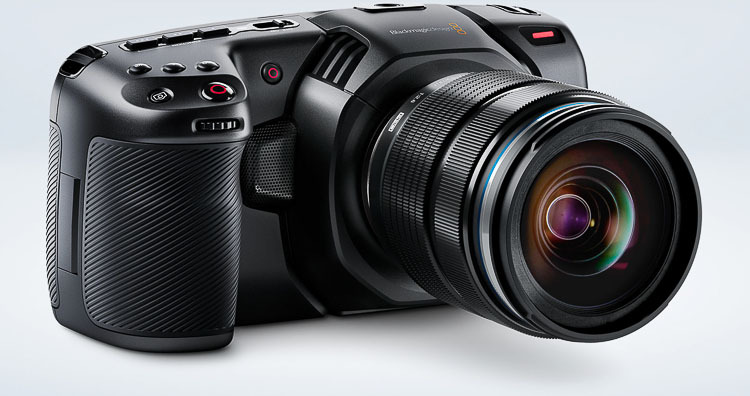 Blackmagic Design has announced the new Blackmagic Pocket Cinema Camera. The BMPCC4k features an all new handheld design. The Blackmagic Pocket Cinema Camera 4K has a 4/3 size sensor, 13 stops of dynamic range and dual native ISO up to 25,600. 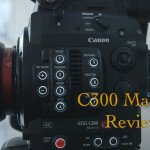 Initially the Dual Native ISO was featured in the Panasonic Varicam which had ISO 800 and ISO 5000 as dual native ISOs. However, BMD claims a whooping ISO 25600 as the Dual Native ISO. That means on theory you get stunning HDR images and incredible low light performance. It is to be seen how this claimed Dual Native ISO is implemented and the performance in actual conditions. Since the Blackmagic Pocket Cinema Camera 4K has a portable and affordable design which shoots upto 4k 60p, it should be perfect for shooting independent films and documentaries, fashion shows, travel blogs, web videos, weddings, corporate video, sports and more at a much lower price point. The portable handheld design of the Blackmagic Pocket Cinema Camera 4K gives you incredible mobility without sacrificing features. The highly compact form factor features a carbon fiber reinforced composite body that makes it extremely durable and lightweight so you can take it anywhere. You get a super bright 5” screen, 4 built in microphones, built in recorders and external buttons and dials that give you fast access to the most important functions. That means you can quickly check framing and focus, capture audio and record your files without having to carry around extra monitors, microphones, recorders and cables. You also get lots of mounting points, a mini XLR input with phantom power, Bluetooth control and more. With the Blackmagic Pocket Cinema Camera 4K you get a fully featured portable digital film camera that’s flexible and expandable! The Blackmagic Pocket Cinema Camera 4K uses the MFT (Micro Four Thirds) lens mount. If you don’t have MFT lenses then you can use adapters for PL, C, EF mounts to use those lenses. The BMPCC 4K camera records using standard SD cards, UHS-II cards or CFast 2.0 media! If you are shooting HD video, then it can be recorded to the inexpensive inexpensive SD cards. 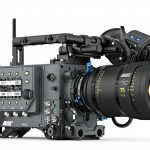 Higher performance UHS-II cards can be used for recording Ultra HD in ProRes at up to 60 frames per second and RAW at up to 30 frames per second. CFast cards can record 12-bit RAW at all supported frame rates. For longer recording times, you can also record directly to an external SSD or flash disk using the built in USB-C Expansion Port! Best of all, there’s nothing proprietary. The files will work with all professional post production software. You can even mount the media cards on your computer and start editing directly from them using the included DaVinci Resolve Studio software! 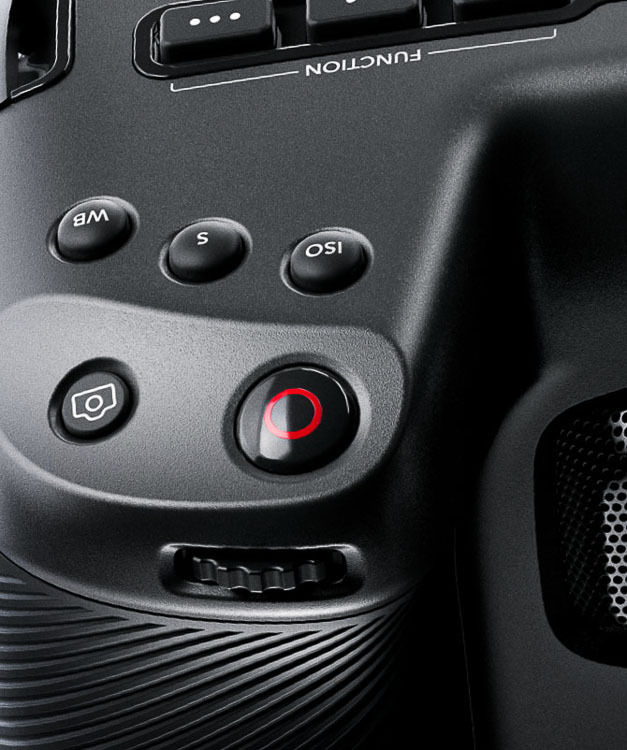 The Blackmagic Pocket Cinema Camera 4K features an innovative high speed USB-C Expansion Port. USB-C is fast, flexible and even provides power, so it’s quickly becoming standard on all modern computers and devices. The massive bandwidth of USB-C makes it possible to connect external accessories such as flash drives and SSDs for significantly longer recording times. This can be important when shooting high quality lossless 12-bit RAW or even high frame rate 60 frame per second 4K. Best of all, when you’re done shooting you can use the same drive for editing and post production! The Blackmagic Pocket Cinema Camera 4K gives you professional high fidelity audio recording so you don’t have to carry around a separate sound recorder! 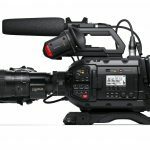 The camera features a mini XLR input with 48 volts of phantom power for connecting professional microphones such as lapel mics and booms. There are also built in microphones with an extremely low noise floor so you can capture great sound on location! There’s even a 3.5mm stereo audio jack so you can use different types of video camera microphones. The Blackmagic Pocket Cinema Camera 4K uses standard removable LP-E6 type batteries. 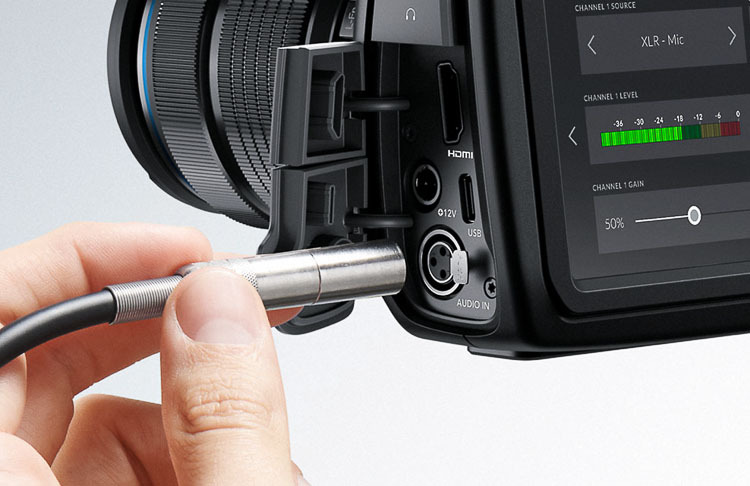 You also get a locking DC power connector so it can’t be accidentally disconnected in the middle of a shoot. The included 110 – 220 volt plug pack can be used to simultaneously power the camera and charge the LP-E6 battery. Plus, it includes international socket adapters so it can be used anywhere in the world! The USB-C Expansion Port accepts power so you can charge the battery from portable battery packs, a mobile phone charger or even your laptop computer! The Blackmagic Pocket Cinema Camera 4K includes a full version of DaVinci Resolve Studio, which is a complete post production solution. You get the world’s most advanced solution that combines professional editing, color correction, audio post and visual effects all in one software tool! DaVinci Resolve is used to finish more Hollywood feature films than any other solution, so you’ll get the best possible post production tools to edit native video from your camera and retain every bit of quality. Whether you’re working on major Hollywood feature films, episodic television productions, music videos, commercials or even the latest YouTube shoot, DaVinci Resolve Studio gives you a completely lossless workflow for native editing, color correction, effects, audio and delivery, so your video always looks as good as possible! The BMPCC 4K Pocket camera is priced at $1349 US dollars and would be available in September 2018. However the BMPCC 4K camera is listed as on $1295 USD in B&H site at the link below. Effective Sensor Size: 18.96mm x 10mm (Four Thirds)Lens Mount: Active MFT mountLens Control: Iris, focus and zoom on supported lenses.Dynamic Range: 13 Stops.Shooting Resolutions: 4096 x 2160 (4K DCI), 3840 x 2160 (Ultra HD), 1920 x 1080 (HD).Frame Rates: Maximum sensor frame rate dependent on resolution and codec selected. Project frame rates of 23.98, 24, 25, 29.97, 30, 50, 59.94 and 60 fps supported. Off-speed frame rates up to 60 fps in 4K DCI, 120 fps in HD windowed.Focus: Focus button turns on peaking, auto focus available using compatible lenses.Iris Control: Iris wheel and touchscreen slider for manual iris adjustment on electronically controllable lenses, iris button for instant auto iris settings on compatible lenses so no pixel is clipped in film mode. Scene average auto exposure in video mode.Screen Dimensions: 5” 1920 x 1080.Screen Type: LCD capacitive touchscreen.Metadata Support: Automatically populated lens data from electronic Micro Four Thirds lenses. Automatic recording of camera settings and slate data such as project, scene number, take and special notes.Controls: Touchscreen menus on 5 inch screen. 1 x Power Switch, 1 x Record Button, 1 x Stills Button, 1 x Scroll Wheel with push integrated into handgrip, 1 x ISO Button, 1 x White Balance, 1 x Shutter Button, 3 x software configurable Fn buttons, 1 x High Frame Rate (HFR) Button, 1 x Zoom Button, 1 x Menu Button, 1 x Play Button, 1 x Focus Button and 1 x IRIS Button.Total Video Outputs: 1 x HDMI Type AAnalog Audio Inputs: 1 x mini XLR analog switchable between mic with phantom power support and line level (up to +14dBu). Analog Audio Outputs: 1 x 3.5mm headphone jack. Computer Interface: USB Type-C for external drive recording, software updates and media download. HD Video Standards: 1080p23.98, 1080p24, 1080p25, 1080p29.97, 1080p30, 1080p50, 1080p59.94, 1080p60. Ultra HD Video Standards: 2160p23.98, 2160p24, 2160p25, 2160p29.97, 2160p30, 2160p50, 2160p59.94, 2160p60. 4K DCI Standards: 4KDCIp23.98, 4KDCIp24, 4KDCIp25, 4KDCIp29.97, 4KDCIp30, 4KDCIp50, 4KDCIp59.94, 4KDCIp60. Codecs: CinemaDNG RAW, CinemaDNG RAW 3:1, CinemaDNG RAW 4:1, ProRes 422 HQ QuickTime, ProRes 422 QuickTime, ProRes 422 LT QuickTime, ProRes 422 Proxy QuickTime. Storage Type: 1 x CFast 2.0., 1 x SD UHS-II card. This one is definitely going to be my next Camera. 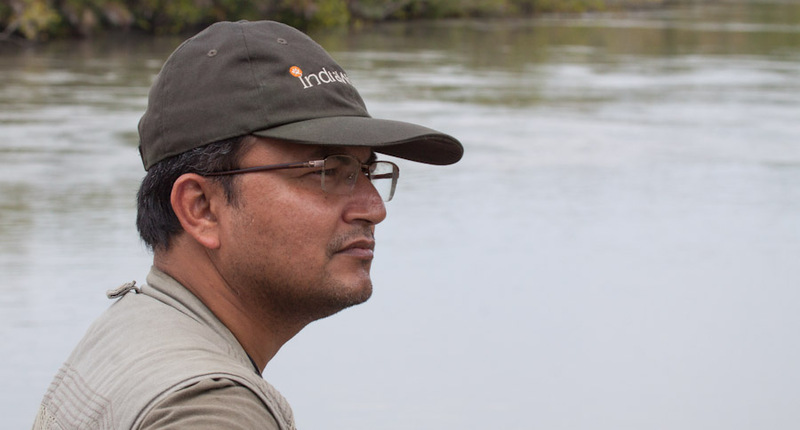 Recently bought Canon 80D and loving it. 🙂 Set an eye for BMPC. One of my future goal to reach in my youtube journey. Pls contact us regarding Pocket Cinema Camera 4K purchase. 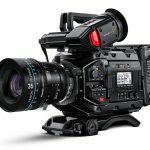 We are the authorised Blackmagic Partner dealing all Blackmagic products. You can see our unboxing video in YouTube & Facebook. We are selling across India.